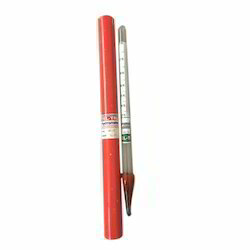 We offer Specific Gravity Hydrometer to our valuable clients. 15410: 0. 600-0. 800 sp. Gr. 15411: 0. 800-1. 000 sp. Gr. 15412: 1. 000-1. 200 sp. Gr. 15413: 1. 200-1. 400 sp. Gr. 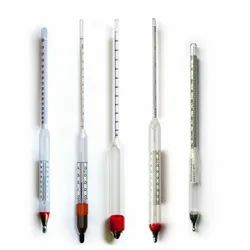 A Specific Gravity Hydrometers is an instrument used to measure the specific gravity (or relative density) of liquids.Hydrometers usually contain a scale inside the stem, so that the specific gravity can be read directly. 1. Electronic balance, capacity 5 kg. Least Count 0.1gm, provision is made in this balance to suspend density basket under material pan. This balance is mounted on an angle iron frame stand. 3. Air tight container to suspend density basket. Lightweight and easy operation. Can show a lot of information. Ergonomically-designed Portable Density and Specific Gravity Meter with backlit display for easy reading. 1. Backlit display enables you to perform measurement in a dark place. 3. ID code can be entered. 4. Sampling volume and speed can easily be adjusted in one hand. To check the specific gravity of rubber and other elastomers, we offer technically advanced “HIROSHIMA Specific Gravity Balance. Its faster and accurate readings can give results in about half a minute.